Keeping Kids in School....Using Sports as the Tool. The Langley Chiefs and PuCKS hosted a pair of very special nights at the George Preston Recreation Centre. The Langley Chiefs provided “PuCKS support” during their Nov. 1 home game at the George Preston Recreation Centre. The junior A hockey team beat Powell River 5-3 that night while teaming with the PuCKS program to benefit children in the community. 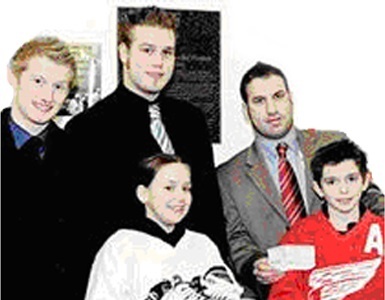 Proceeds from 50-50 ticket sales during “PuCKS Night” went to the PuCKS Program Society. Langley Chiefs defencemen Chris Ickert and Jessie Tresierra joined goalie skates recipient Maranda Rudolph, Chiefs associate coach Chris DiFrancescantonio, and Connor McLean from PuCKS for a special presentation during the team’s Jan. 19 home game at the George Preston Recreation Centre. The program does this in several ways – one of which is by offering hockey scholarships and gear to children in financial need. During the Chiefs’ Jan. 19 home game versus Cowichan Valley, three PuCKS scholarship recipients – Adam Bear, Maranda Rudolph, and Connor McLean – enjoyed a pre-game warm-up skate with the players as their “seventh man.” They sang the national anthem on-ice beside the Chiefs, and received a cheque on behalf of the PuCKS Program from the proceeds of the November PuCKS Night. Sending Love to Our Hero, Gordie Howe!